An auction in New York next week will see the sale of 17-metre fossilized skeletons of two dinosaurs. What makes those fossils interesting is the fact that they were locked in combat when they died and they are still in battle pose. Thomas Lindgren, of auction house Bonhams, said both the dinosaurs killed each other and the pair is important from science’s point of view. According to Reuters, the price for the Dueling Dinosaurs could set a record at the fossil auction. The North American fossils are estimated to fetch anywhere between $7 and $9 million. A Tyrannosaurs Rex skeleton named Sue is the current record holder for most expensive dinosaur fossil purchased at auction. Sue sold for $8.3 million in 1997. However, LiveScience notes that the sale of the Dueling Dinosaurs may destroy their value to science. The science website points out that even legally obtained fossils are sometimes ignored by paleontologists when they’re placed on the auction block for big money. 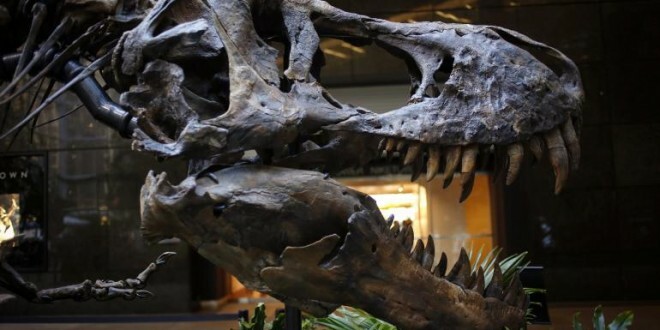 Would you pay millions of dollars for a set of dinosaur fossils? Will the Dueling Dinosaurs become the most expensive dinosaur fossils ever sold at auction? Start conversation by sharing your thoughts and predictions in the comments section.